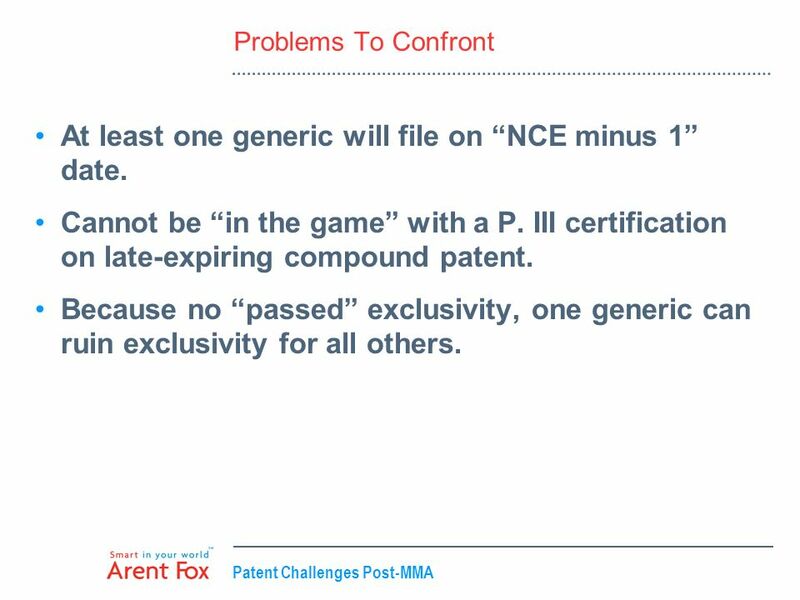 When filing ANDA, generic required to make one of four certifications as to status of any patents. 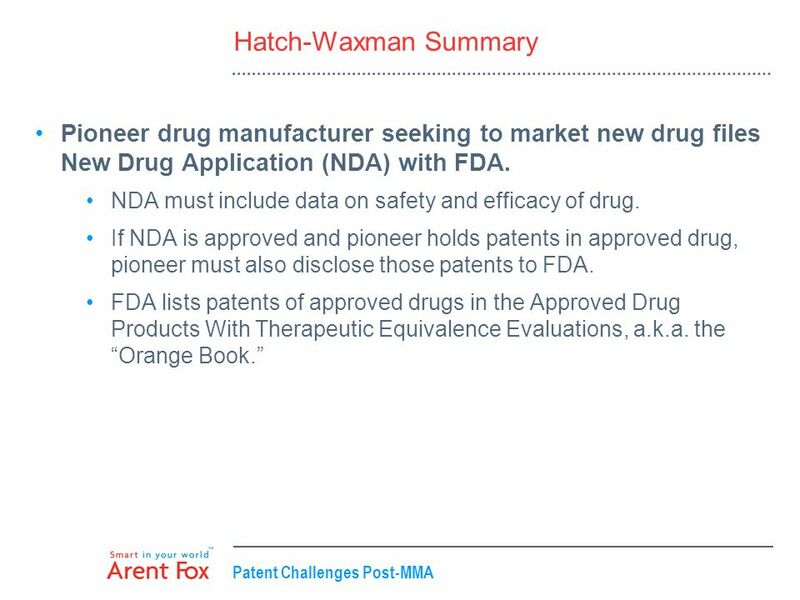 (I)	no such patent information has been submitted to FDA (no patents in Orange Book). 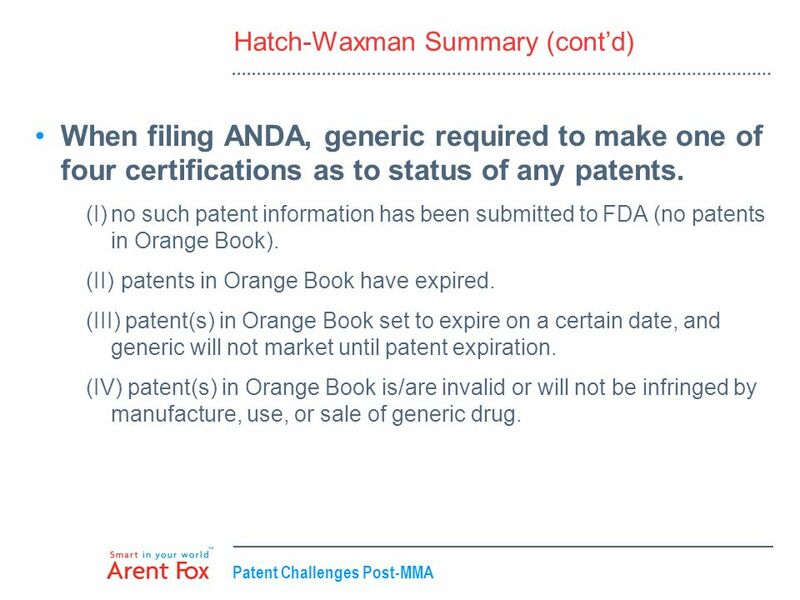 (II)	patents in Orange Book have expired. (III) patent(s) in Orange Book set to expire on a certain date, and generic will not market until patent expiration. (IV) patent(s) in Orange Book is/are invalid or will not be infringed by manufacture, use, or sale of generic drug. 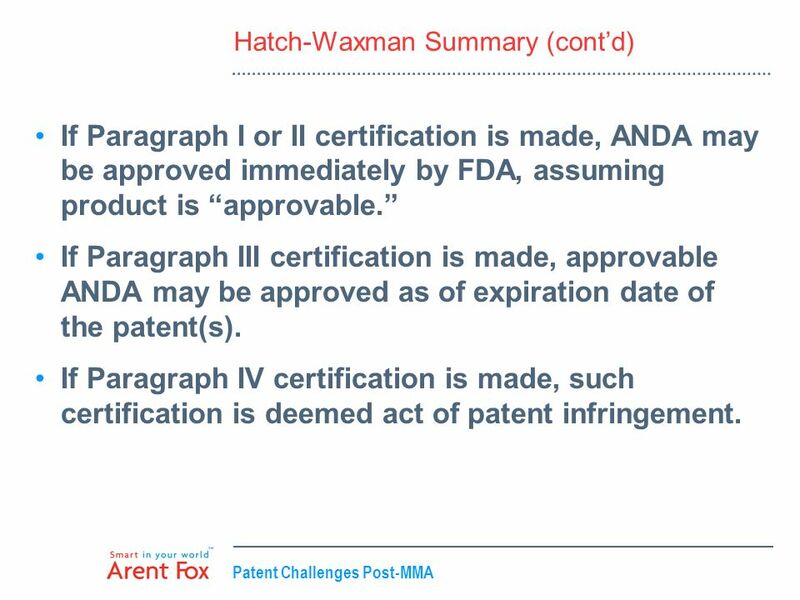 If Paragraph I or II certification is made, ANDA may be approved immediately by FDA, assuming product is “approvable.” If Paragraph III certification is made, approvable ANDA may be approved as of expiration date of the patent(s). If Paragraph IV certification is made, such certification is deemed act of patent infringement. 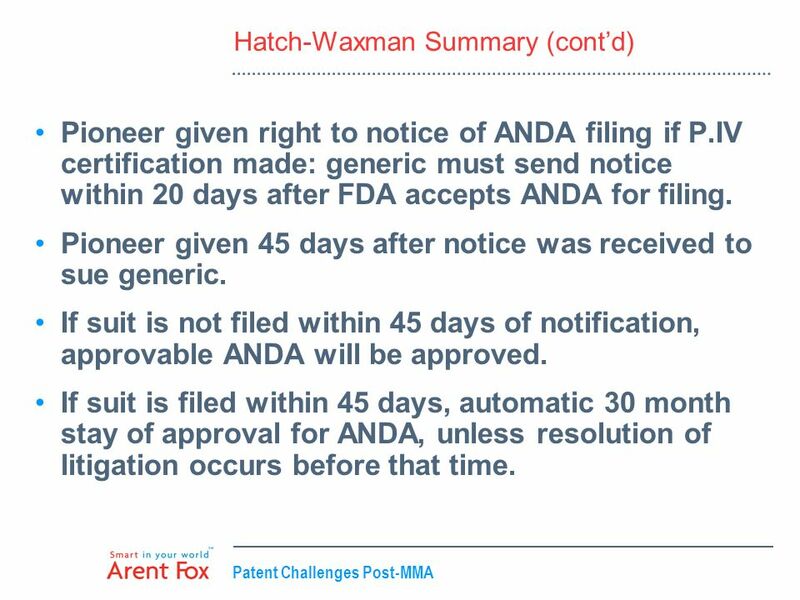 Pioneer given right to notice of ANDA filing if P.IV certification made: generic must send notice within 20 days after FDA accepts ANDA for filing. Pioneer given 45 days after notice was received to sue generic. If suit is not filed within 45 days of notification, approvable ANDA will be approved. If suit is filed within 45 days, automatic 30 month stay of approval for ANDA, unless resolution of litigation occurs before that time. Why go “Paragraph IV”? First ANDA applicant with a P. IV Certification granted 180 days of marketing exclusivity. Generic can charge approximately 2/3 price of pioneer if first on market. Large incentive to be first applicant. 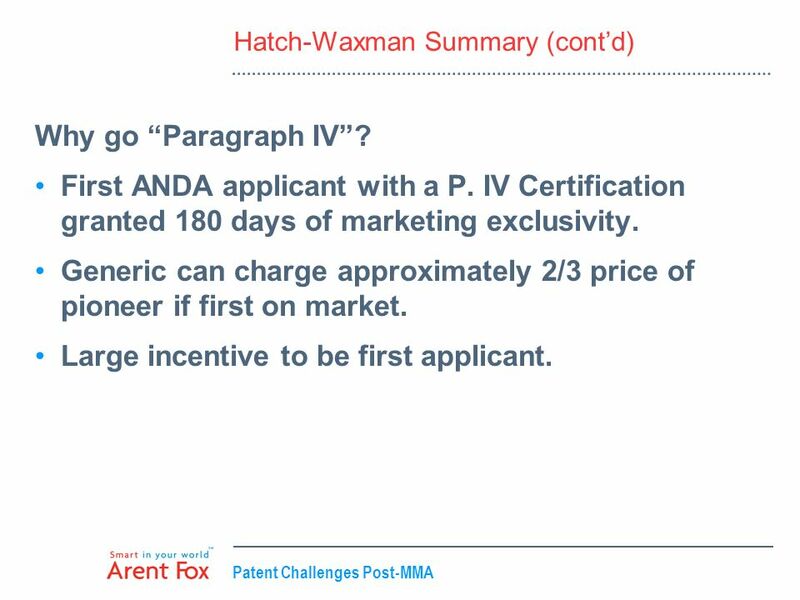 First generic applicant to file an ANDA containing a P. IV certification is awarded 180 days of marketing exclusivity. During exclusivity period, FDA cannot approve a subsequent ANDA with a P. IV certification for the same drug product. 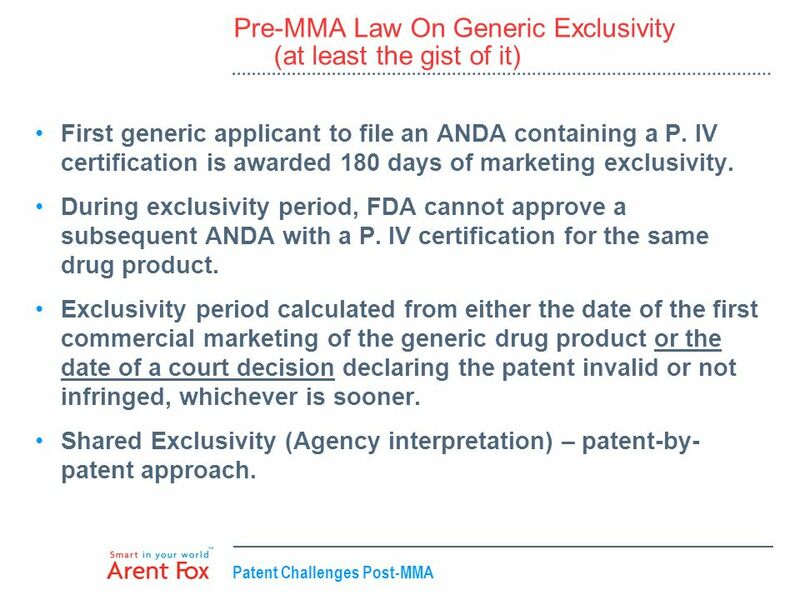 Exclusivity period calculated from either the date of the first commercial marketing of the generic drug product or the date of a court decision declaring the patent invalid or not infringed, whichever is sooner. 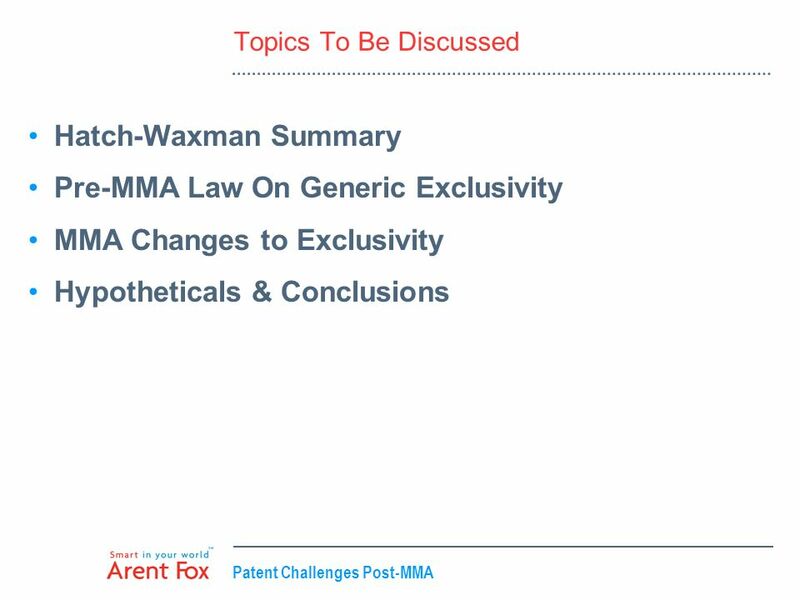 Shared Exclusivity (Agency interpretation) – patent-by-patent approach. Shared exclusivity – product-by-product approach Exclusivity begins only upon commercial marketing (no court decision trigger). 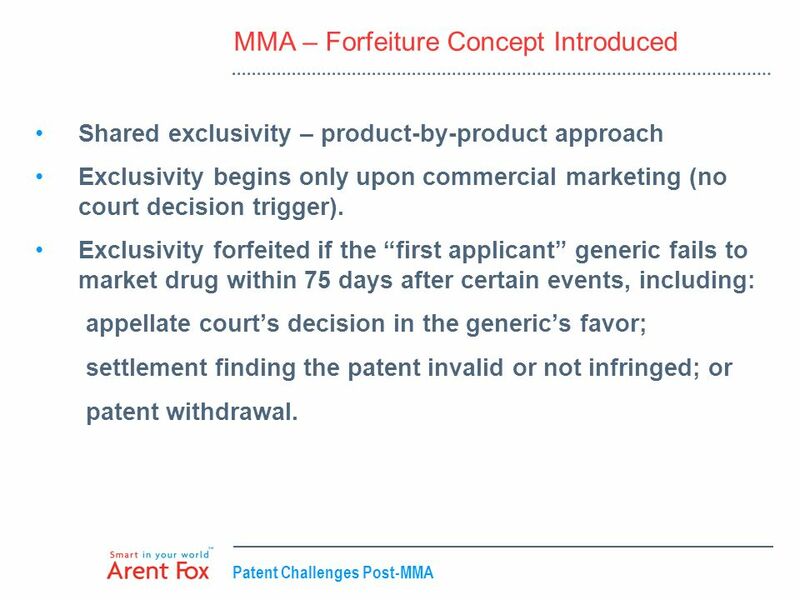 Exclusivity forfeited if the “first applicant” generic fails to market drug within 75 days after certain events, including: appellate court’s decision in the generic’s favor; settlement finding the patent invalid or not infringed; or patent withdrawal. 10 Which patents to challenge? 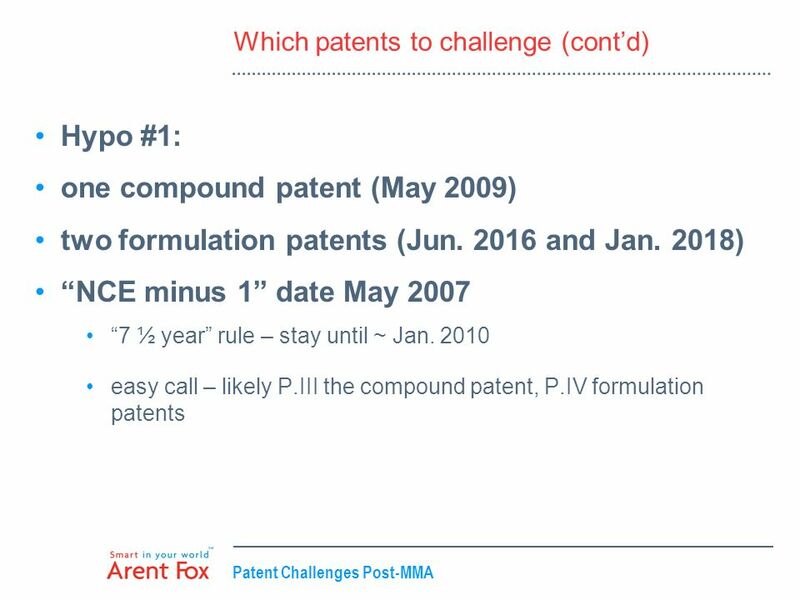 Hypo #2: one compound patent (May 2011) two formulation patents (Jun and Jan. 2018) “NCE minus 1” date May 2007 “7 ½ year” rule – stay until ~ Jan. 2010 tougher call – P.III or P.IV compound patent? 15 At least one generic will file on “NCE minus 1” date. Problems To Confront At least one generic will file on “NCE minus 1” date. 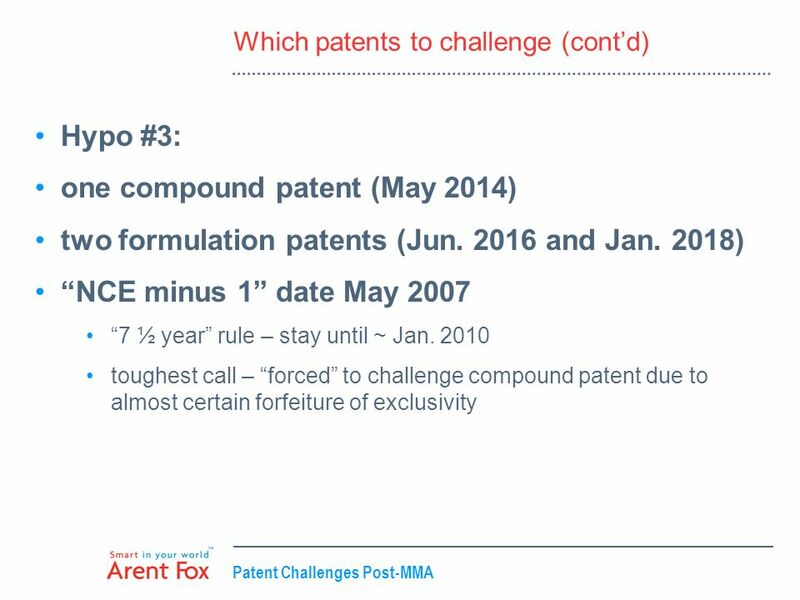 Cannot be “in the game” with a P. III certification on late-expiring compound patent. Because no “passed” exclusivity, one generic can ruin exclusivity for all others. 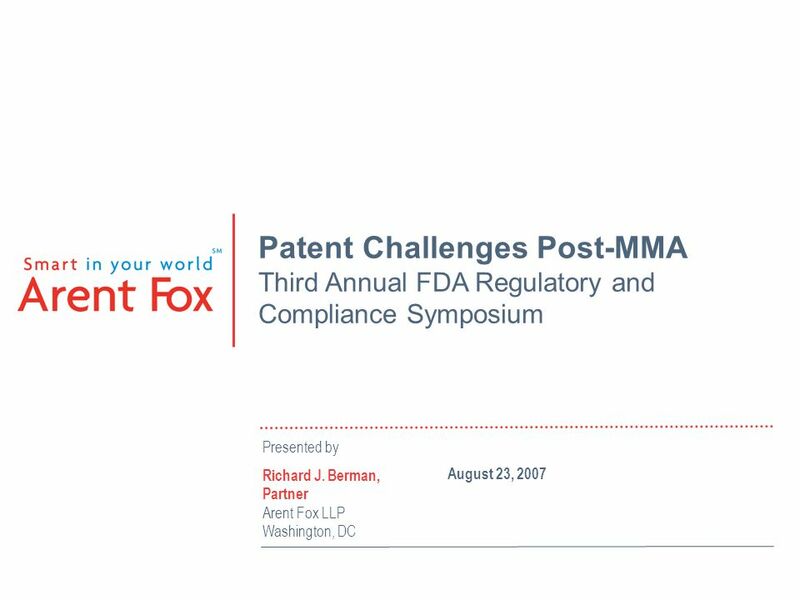 Download ppt "Presented by Richard J. Berman, Partner Arent Fox LLP Washington, DC"
Intellectual property rights and procurement = international developments & national experiences = Bi-regional Workshop on procurement and supply management. Reporting and Disclosure Requirements - Module 1 Gainful Employment 1. AXINN, VELTROP & HARKRIDER LLP © 2007 | AXINN, VELTROP & HARKRIDER LLP Click To Modify Title Name Goes Here FDA Hearings on the BPCI Act. 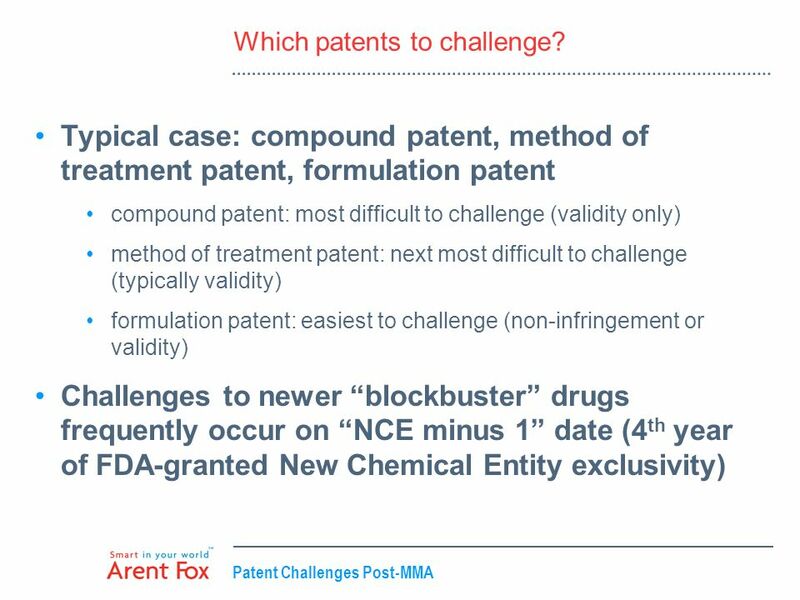 Patent-Extender Drugs: Loop-holes in the Law Sandy H. Yoo 4/14/06. Pharma Workshop IV Patent Linkage in the USA Lawrence T. Welch Eli Lilly and Company. 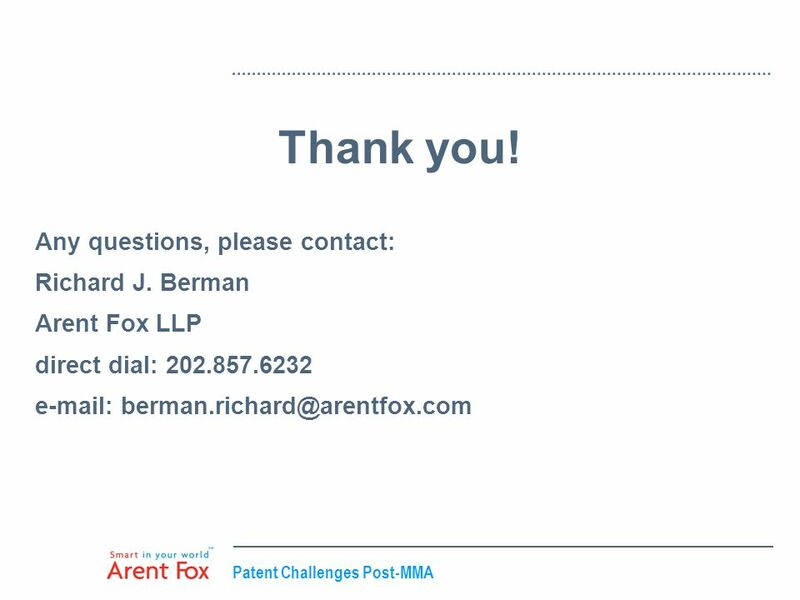 Getting Your Startup to Work for You How Innovators Can Use US Patent Law to Protect Their Startups Shelly Rosenfeld Lewis Brisbois Bisgaard & Smith LLP. 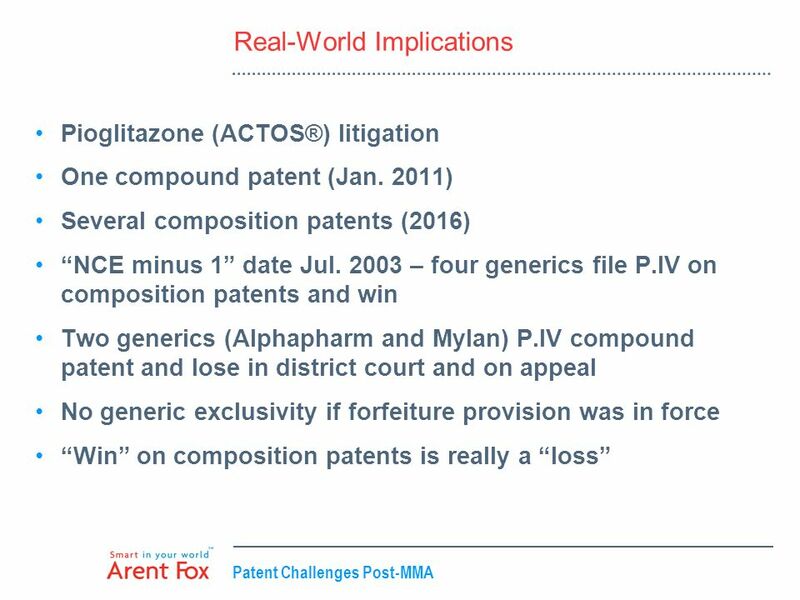 The Gaming of Pharmaceutical Patents Brief Overview. Exclusivity And FDA Barriers To Market Entry In The US Brian V. Slater, Esq. Fitzpatrick, Cella, Harper & Scinto Pharmaceutical. AXINN, VELTROP & HARKRIDER LLP © 2007 | How to Align the FDA Approval Process with PIV Strategy Chad A. Landmon 90 State House Square 1330. FDA Counsel.com 1 ANDAs, OTCs, Orphans and Cosmetics -- Key Issues Wednesday, August 18, 2004 SDRAN RAC STUDY COURSE Michael A. Swit, Esq. FDACounsel.com. H I R S C H & P A R T N E R S A v o c a t S o l i c i t o r R e c h t s a n w a l t Pharmaceutical settlement agreements and competition law A litigation.